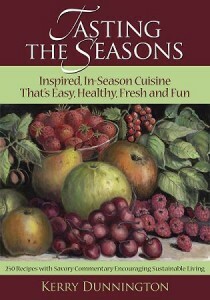 Just in time for fall entertaining and family gatherings, a new cookbook Tasting the Seasons, by Kerry Dunnington, offers exciting new recipes that take advantage of seasonal ingredients. “Tasting the Seasons was created from my belief that the most delicious, healthy meals are made from fresh, seasonal, pesticide-free food supplied by local farmers who are committed to sustainable practices” says Dunnington. Creative cooks will enjoy Dunnington’s appetizers like Baked Brie with Cherry Preserves and Amaretto or Chickpea Mousse with Caramelized Onions. Interesting mains are Bourbon Pork with Creamy Mustard Sauce, Shrimp and Vegetable Quesadillas and A Feta Compli Spinach Pie. Not only is this soup simple to assemble, it’s nutritious, requires very little cooking time, and it’s beautiful. For a delicious meal, serve with a hearty loaf of bread. In a large soup pot, heat oil over medium heat and sauté garlic and mushrooms. Cook, stirring frequently, until mushrooms are tender, about 3–5 minutes. Add chicken broth, chickpeas, tomatoes and spinach. Cover, raise the temperature a notch, bring soup to a boil, and then reduce heat to simmer. Season the soup with salt and pepper. Ladle soup into bowls. 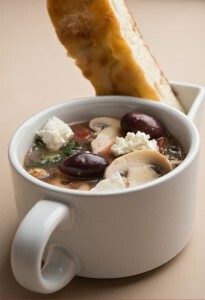 Serve immediately and pass the feta cheese and black olives to your guests. This is the perfect salad to prepare during the fall and winter months; it complements hearty meats, soups, stews and casseroles that are typically served this time of year. In a medium bowl, combine sugar, salt and dry mustard. Add onion and apple cider vinegar. Slowly add oil, whisking constantly. You’ll see the mixture change texture as you whisk. After all the oil has been added and dressing has thickened, stir in celery seeds. Mix until well blended. Transfer dressing to a 2-cup jar with a tight-fitting lid and refrigerate. (Apple Cider Celery Seed Dressing will last for several days in the refrigerator.) Allow to come to room temperature before serving. Shake well prior to using. 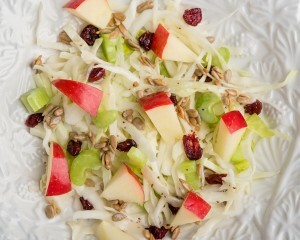 In a large bowl, combine cabbage, celery, chopped apple, cranberries and sunflower seeds. 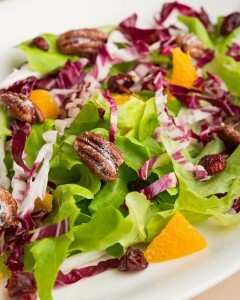 Toss the salad with the Apple Cider Celery Seed Dressing with just enough dressing to coat the ingredients. Serve immediately. Tasting the Seasons, by Kerry Dunnington. ©2014. Published by Artichoke Publishers. Photo Credit: Whitney Wasson, photographer. Used with permission from Artichoke Publishers. Eat Your Way to Better Health Super Bowl Fun Food When You Don’t Count Calories Play it Healthy with Super Bowl Recipes Chocolate Indulgence Are Coconuts the Next Superfood?